We are approaching Thanksgiving Day here in the United States, and I hope every one of us will stop and remember how abundantly blessed we are. But I hope we don't reserve this practice just for the fourth Thursday in November. Or for Christmas. Or for New Year or Easter or our birthdays or anniversaries or any other special occasion. Gratitude ought to be an everyday thing. And you know what? It's good for you! My parents always told me I was an unusually happy child. But when I grew up, I struggled with depression. Not really clinical depression. I didn't take medication for it or need to. I just wasn't usually very happy. Then I heard someone (I wish I could remember who it was and send her a dozen roses!) say her life changed when she decided to take time every day to write down three things she was thankful for. Just write them down. Every day. That was it. It took me just a minute to do. I didn't think much of it. But it didn't take very long doing this every day before I realized I was happier. I truly was. And I had so much to be thankful for. Looking back over some of the things I've written down over the past almost nine years, from the amazing ("I'm a writer") to the silly ("Key Lime pie") to the vital ("He is risen indeed! "), I see a wonderful record of God's love and mercy, provision and guidance and help, and just abundant goodness. So stop and give thanks. Count your blessings. Every single day. In everything give thanks, for this is God's will for you in Christ Jesus. P. S. I have to praise God for a continuing miracle in my life. 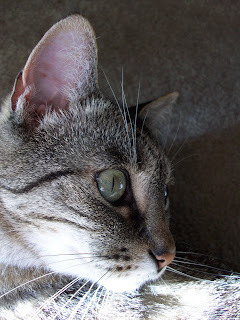 My sweet little cat Emily was diagnosed with cancer in February, 2010. The vet did surgery and gave her five to six months to live. I prayed hard, believe me, and still pray daily, that God would have mercy on Emily (and me!) and heal her. A couple of weeks ago, I noticed a sore place on Emily's back right where her surgery had been. I figured the cancer had returned and, truly grateful that I had her much longer than the vet predicted, I started preparing myself for the worst. But I took Emily to the vet to see if what I suspected was true and to see what could be done to make her comfortable. The vet said the sore was from Emily licking an allergy-related hot spot. Nothing to do with cancer. In fact she said Em looked really healthy. It's a total miracle, and believe me, I give thanks for it every day. Is it just me, or are most writers a little manic depressive, especially about their careers. I'm thankful for three absolutely amazing children. DeAnna, your kitty story brought tears to my eyes. It reminded me of the extra six months we had with our kitty when she was diagnosed with renal failure. I'm so thankful for my son, my family, my job, and my special friends. I'm also thankful that the snow didn't stick on the ground. And, as tired as I am of taking pills, I'm thankful for medicine that will make me better. Now I've got the Veggie Tales "a thankful heart is a happy heart" song in my head (from Madame Blueberry)! I'm thankful for... my grandson, my children, and a God who loves me unconditionally in spite of myself. Yep, I think all creative types tend toward depression ... probably related to excessive introspection. Praise God for your kitty's health! Do you think it's because we spend so much time in caves? Your cat pic reminds me of our cat, Trouble who lived with us from a few months old until she was 20 yrs. I'm very glad your Emily's life has been extended. Cats give so much joy and comfort to those they choose to love. I'm thankful for my family who tolerate my writing quirks, adventures and conferences so I can further my craft and work toward publication. And I'm thankful for everything God-related. And a farmhouse with a working furnace and a running vehicle. Anita, you said it so well when you said, "Cats give so much joy and comfort to those they choose to love." I think maybe people who are called to be writers are given especially sensitive emotions. How could we be expected to write with real passion if we don't feel it? How can it be real to our readers if it isn't real to us? I was just writing something the other day (something that will never see the light of day), and the tears were pouring down my face. No, I didn't have anything personal that was making me sad, but I was connected to these particular characters and their situation. I hope that came through in what I wrote. That's "the zone" for me. I love hearing what you're all thankful for! I especially love hearing the kitty stories. I think most animals will pay back a hundred fold any love we show them. I've just always have had a special love for cats. They've certainly been worth everything I've put into them over a whole lifetime. I'm so blessed to have them with me. Thank you, Suzie, for putting up with your cat man's love of cats. I know if I was interested in someone who wouldn't/couldn't have cats, that would be a deal breaker for me. I can't imagine not having them. It's good to know I'm not the only one (writer or not) who feels this way! Great post, DeAnna. I try to keep a gratitude journal, and sometimes I write down some pretty goofy or simple sounding things. But everything good comes from God, right? So He should be thanked for them. I'm thankful for my hilarious family, God's mercy, my home... and flannel sheets. I was soooo happy to put flannel sheets on the bed yesterday. Niki, Madame Blueberry is my favorite Veggie Tales. I love the Stuff Mart song and the Cheeseburger song. I am thankful for my 15-year-old Calico cat lying on my lap purring at this moment. I am thankful for sunsets, gorgeous colors. I am thankful for quilting scrappy ***stars*** in all the arrays of color. I am thankful for my family, my patient husband, and my three grown daughters. I am thankful the Lord gave us three wonderful days with my adult son this summer before he died unexpectedly later that week. I am thankful for His great love for us. For friends, for smiles, for our home on a hilltop. That's so great about the Cat. My Mother very strongly believes in praying for animals when they have been sick, both now and in the Past. Thankfully our Present Dog is very strong, and, although beset by a paraniod fear to high-pitched bleeping noises, he really get sick. Though last week he had a near miss when he insisted on riding in the Car (as usual) and wondered off out of the gate and down a nearby road, ignoring our calling him back. Because of having to deal with my 5 year Old Niece at the time my mother could not go after him, but about a quarter hour later she got a phone call from a Lorry Driver who had spotted the Dog walking in the Middle of the Road, picked him up, and promplty bought him back after checking the number on his collar. It could have been so Much worse as people often drive very fast down that particualr road, and they would likely have not seen out dog until it was too late as it had many sharp bends. My Mother really believes Divine Providence prevented Our Beloved Greyhound from getting Hurt or worse, and I do too. Especially considering that my niece recently lost a pet, and is very fond of our dog, and she would have been Devastated (as would we) if anything happened to him. Thankfully we have had no repeat of this behaviour, which was out of character for the bog since, We think it had something to do with fireworks. Oooh, I'm a quilter, too. Isn't it great? I love scrappy! I'm so sorry to hear about your son. I'm glad you had your special time with him. He's sweet, but he aint little. The reason I mentioned my niece in that context was because her little pet hamster had died shortly before. I know that seems insingnifigant, but the implications were more imporatant as she was struggling to make sense of the idea of God's love and care when that happened. I know a 5 year Old may not be able to really appreciate such things. Without being too personal, all I can say is that one of her parents is a Christian but the other is not and has leanings towards Buddhism/Humanism instead, and also cites uses the whole 'why does a God of love allow suffering' idea to reject and challenge Christianity. I can argue against that quite well, but I little five year old who had just seen (hypothetically) an animal she loved die and suffer pain could struggle to understand wht God 'let it happen', and so it could have been a problem for her.